What Is a Routine Venipuncture? What Are Normal CBC Test Results? Hemoglobin is a protein called heme found in red blood cells. It transports oxygen throughout the body and carries carbon dioxide back to the lungs to be expelled. Hematocrit measures the percentage by volume of red blood cells in whole blood. Blood tests routinely test hemoglobin and hematocrit as part of a complete blood count . Normal values for hemoglobin in men number approximately 13.8 to 17.2 grams per deciliter of blood (gr/dL) and 12.1 to 15.1 gr/dL for women, according to Medline Plus. A normal hematocrit for men is approximately 42 to 54 percent, and 38 to 46 percent for women. Wash your hands with an antiseptic cleanser following posted hospital procedures. Put on sterile latex or latex-free disposable gloves after your hands dry. Clean the blood draw site with a hospital-grade antiseptic and gauze pad to kill germs. You may also use an individually packaged antiseptic cleansing pad. The draw is usually taken from the inside of the individual’s elbow or back of the hand. Tie the tourniquet around the upper arm. The veins will swell with blood. Ask the individual to make a fist to make the veins easier to find. Insert the needle carefully into the individual’s vein. Attach the collection vial to the needle and blood and blood will begin to fill the vial. You can attach different vials to the needle to collect multiple samples. Remove the tourniquet and place a sterile gauze pad over the draw site. Gently remove the needle while applying gentle pressure. Bandage the site with another sterile gauze pad and first aid tape, or a sterile adhesive bandage. Clean the blood draw area of the heel or finger. Use the hospital grade antiseptic cleanser and sterile gauze pads, or the individually packed, antiseptic cleaning cloths. Prick the skin by carefully pushing with the lancet. 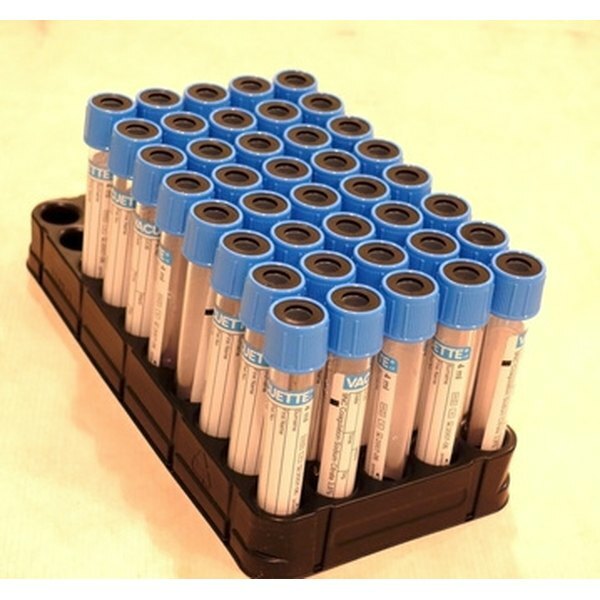 Collect blood with a test strip or microscope slide, or collect it in a pipette (small, glass tube). Cover the site with a sterile gauze pad, applying light pressure to stop any bleeding. Bandage the draw site with another sterile gauze pad and fist aid tape, or a sterile adhesive bandage. Insert the blood samples into the blood analyzer following that particular equipment’s instructions. The analyzer breaks down the red blood cells in the blood and changes the hemoglobin into a solution. A chemical is added that makes it easier for the machine to detect the hemoglobin. A hemoglobin count depends on the amount of light absorbed from a light passing through the solution. Multiply the hemoglobin (Hgb) value by three and round this number to the nearest whole number. In the following example, assume the Hgb is 14.1. Use the formula Hgb x 3 = hematocrit. The example calculation should be 14.1 Hgb x 3 = 42.3 (hematocrit expressed as a percentage). Round 42.3 to the nearest whole number and the hematocrit value for this example is 42 percent. Alternatively, you can use a small, sharp tool called a lancet to puncture the skin and make it bleed. This method often works on infants and young children, but can also be used on adults. Wash your hands with an antiseptic cleanser following posted hospital procedures. Put on sterile latex or latex-free disposable gloves after your hands have dried. Do not attempt to draw blood or use a blood analyzer unless you are a licensed medical professional trained in these procedures.